A wide range of gadgets appeared on the market covering a huge variety of functions staring from remote controls and ending up with PDAs very close to PCs in functionality. Mobile devices entered daily life which leads to a need to integrate them seamlessly into all the human activity areas. WiFi, Bluetooth, cellular networks; with a constant market price reduction all these technologies have become a usual instrument for everyone. Every mobile device is created to solve a set of predefined tasks. From the clients (who orders the design) or end users point of view it is very important that the device solves the necessary tasks with minimal expenses. In this case we do not consider the problem of the user characteristics or the device status. Some times the design itself or the product positioning effects the price. Summarizing, it can be said that when customer comes to a need of proper equipment, he or she has to solve a difficult optimization task choosing from a quite small amount of variants. If we are solving a standard task, the solution of which can be applied not only for the situation involved but also can be required by other customers, the situation looks acceptable. But in case of a specific, new solution (given the market does not offer such a device) situation becomes complicated and a compromise shall be found. Tancher has the significant experience in the mobile devices development which allows to develop its own approach in creating new mobile solutions. It is possible to use modular design if there is a standard way to connect any module to the any platform and the software, both drivers and applications, works under every platform. In this case the customer only has to select the desired platform, set of modules and the device appearance. The rest is to redesign PCB as needed to fit the customers form-factor greatly reducing the development time and expenses. The modular approach in the software is the usual practice widely used almost from the very beginning of the computer programming. In both Windows CE and OST (Operating System by Tancher) this approach was used to full extent providing glut great flexibility and porting ease. OS functions are available with well documented and intuitive C++ interface. It is possible to develop additional interpreted language modules to run, fro example, Java or Python applications and scripts. The component structure of the OST allows great scalability and flexibility optimizing system resource consumption to cover the widest range of application. It should be specially noted that OST is initially designed as operating system for the mobile devices using specific design concepts and resource saving technologies, that somewhat complicates software design providing better performance and application flexibility. As the result, OST provides best characteristics with limited resources, for example, improving battery life and reducing necessary memory footprint and CPU power consumption. Liantec Systems Corporation announces the Tiny-Bus(TM) modular expansion solution as the standard embedded system integration solution. The Tiny-Bus(TM) is integrated with 16xPCI-Express Graphics, AGP, PCI-Express and PCI bus interfaces on the 2.920 x 3.600 inches of daughterboard. With the Tiny-Bus(TM) modular expansion solution, the system integrators can build their niche platform systems with special interface modules easily, quickly and cost effectively. The Tiny-Bus(TM) modular expansion solution is integrated with the popular bus interface including the 16xPCI-Express Graphics (PCI-EG), AGP, PCI-Express (PCI-E) and PCI in four board-to-board connectors. For the different applications, the system integrators can choose the interface module for their niche computing platform including 16xPCI-EG based NVIDIA MXM mobile graphics module, Intel SDVO 1080i HDTV module, 4xPCI-E SATA RAID module, PCI-E Gigabit Ethernet module, PCI-E ExpressCard module, AGP-based VGA module, Intel DVI, VIA DVP, SiS VB based graphics expansion module, PCI-based PCMCIA, video capture, switch hub, multiple Ethernet and mini-PCI modules, and other 16xPCI-EG, AGP, PCI-E, PCI-based customized modules. For the software builders and system integrators, the Tiny-Bus(TM) modular expansion solution can be help them to build the different platform for different application easily, quickly and cost effectively. With the Tiny-Bus(TM) modular expansion solution, the system integrators can build their systems with the same motherboard and different interface modules for different application, or use the same interface module on different motherboard to separate the marketing position with different CPU platform. With the Tiny-Bus(TM) modular expansion solution, the system integration can be done with the embedded interface modules at the same size as the motherboard. This feature of Tiny-Bus(TM) modular expansion solution bring the benefit of space-saving for the system integrators who need the smallest, compact and slim-type system enclosure for the space-limited embedded computing application. To meet the demand of customized ODM/OEM service, the Tiny-Bus(TM) modular expansion solution makes it possible to build the customized niche platform based on the existing motherboard and a new customized interface module. With the same motherboard, the technical risk, lead time and NRE cost of customized ODM solution is under control within the customized interface module rather than a total new motherboard. For the further information about Tiny-Bus(TM) modular expansion solution, please visit the website at http://www.liantec.com/product/TBM.htm. Mosaic Industries has released the QScreen ControllerTM, a low cost C-programmable embedded computer with a built-in graphical user interface. Powered by an HC11 Motorola microprocessor, the QScreen is ideal for OEM applications such as embedded systems, scientific instruments, robotics, and portable data acquisition. The QScreen Controller sports a touchscreen-operated graphical user interface on a high-contrast 128x240 pixel display with a 5x4 touchscreen overlay. It also features a real-time multitasking operating system, hundreds of pre-coded device drivers, and up to 1M Flash and 512K RAM. The QScreen Controller commands eight 8-bit A/D lines, 8 digital I/O lines including timer-controlled and PWM channels, and two RS232/485 ports. Pre-coded I/O drivers are provided for all I/O, and make it easy to do data acquisition, pulse width modulation, motor control, frequency measurement, data analysis, analog control, PID control, and communications. Highly expandable, the QScreen can host up to 7 WildcardsÂ, small stackable I/O modules for sophisticated and dedicated I/O. Available Wildcards include octal 12-bit D/A and 16-bit A/D converters, a 24-bit resolution analog data acquisition subsystem, Compact Flash card mass memory interface, fast buffered RS232/485 dual UART, high voltage/high current isolated I/O, and AC or DC solid state relays. The QScreen Controller is priced at $ 359.00 in 100s. Already ruggedized for dependable computing in sites subject to extreme temperatures, shock, and vibration; the Acromag I/O Server Industrial PC now has Underwriters Laboratory (UL) certification for Class I Division 2 Group A, B, C, D hazardous locations with volatile substances. This UL approval permits use of the I/O Server fanless embedded computer and its plug-in I/O modules in environments with flammable liquids, gases, or vapors. UL’s Class I Div 2 certification is often required for electronics deployed in chemical, oil, gas, mining, and other manufacturing facilities. With the higher safety rating, the I/O Server can be installed closer to sensors and actuators to reduce installation costs for monitoring and control of automated machinery. Additionally, the I/O Server has no internal cables and conduction cooling removes heat without open vents or fans for more reliable operation from -40 to 75°C. “The I/O Server's tightly integrated approach to embedded computing and I/O signal processing is ideal for controlling manufacturing machinery in hazardous locations,” states Joseph Primeau, sales and marketing director – embedded products. The I/O Server is a compact, industrial-grade computer with an Intel Atom® or AMD Geode® CPU and an integrated carrier card that holds up to four plug-in I/O modules to perform measurement and control functions. More than 20 I/O modules are available to provide high-density A/D, D/A, discrete level control, counter/timer, and serial communication functions. CAN bus, Mil-Std-1553, and configurable FPGA modules offer advanced control capabilities for specialized applications. High-density screw-down connectors on the front panel provide clean, secure cable access for up to 192 channels of field I/O signals. Two models offer a choice of an embedded Intel Atom N270 1.6GHz or AMD Geode LX800 500MHz CPU that runs on Windows® Embedded Standard or Linux® and has up to 1GB of DDR2 RAM. Standard interfaces include VGA graphics, two Ethernet ports, two serial ports, four USB ports, a CompactFlash® slot, and audio input/output jacks. An internal 2.5” PATA hard disk or solid-state drive is accommodated as a user-installed option. I/O Server units have a rugged, extruded aluminum enclosure that is ideal for use in hostile industrial environments common in manufacturing, defense, transportation, and research applications. The hardened design has no internal cabling and is resistant to shock (5g) and vibration (50g) for higher durability. Sophisticated thermal management techniques eliminate the need for vents or mechanics that could permit contaminants to enter or moving parts to fail. As a result, an I/O Server with four I/O modules operates reliably across wide temperature ranges between -40 to 75°C (-40 to 167°F). In addition to the UL/cUL Class 1 Division 2 certification, the I/O Server is CE marked and FCC compliance meets FCC Part 15, Subpart B for Class A digital devices. The power supply requirement is 9-32V DC ±10% at 60 watts maximum. Power usage depends on the I/O modules used, but is typically about 30 watts. To simplify software development, Acromag offers several programmer support tools. A Windows development package provides API development software and Win32® DLL drivers, plus examples for C, Visual Basic®, .Net, and LabVIEW® environments. The Linux software includes a library of I/O function routines to speed code development. Both packages include demonstration programs with C source code to test and exercise the I/O module operation. For more information about Acromag products, call Inside Sales at (248) 295-0310 or Marketing Communications at (248) 295-0310, FAX (248) 624-9234. E-mail solutions(at)acromag(dot)com or write Acromag at P.O. Box 437, Wixom, MI 48393-7037 USA. The web site is http://www.acromag.com. Created Equal today announces a unique computer training system for individuals and organizations: TeachMac. TeachMac and its upcoming Windows companion TeachIT are free applications that run a package of multimedia tutorials. The tutorial modules work under their respective applications on Mac and Windows machines. There are fifteen modules available now, including subjects like email, word processing and spreadsheets, with many more are on the way. TeachMac and TeachIT modules contain brief multimedia lessons with both text and video to help individuals learn what they need to know at their own pace. Rather than reading a book or sitting through an entire video and later returning to their computer, users get lessons on what they need on their own computer, and can immediately apply what they learn. Because the modules are downloaded from the internet and reside on the user’s computer, they are portable and they can easily be updated (usually free of charge). In addition, users can combine lessons from existing modules to create their own modules and share them with friends and family regardless of platform preference. Created Equal is also taking a page from the iTunes music store and improving on that. Like iTunes, users can view and download existing modules right from inside the application. If a payment is required, that payment is handled securely and easily. “We go a little further with our service, however, as customers can buy modules individually or they can buy a subscription and have access to our entire library for one low price.” Some modules are free while others cost $ 5 to $ 15. Yearly subscription are only $ 49. Schools and other organizations will benefit from Created Equal’s inexpensive site licenses and generous terms which include access for all site personnel (students, teachers and staff) and their families. Details are available at TeachMac.com. TeachMac is free and available now. TeachIT is coming this summer. TeachMac- Apple Macintosh computer with a PowerPC G3, G4, G5, or Intel processor; Mac OS X 10.3.9 or higher; QuickTime 7 or later; Internet connection for downloading modules. TeachMac is a proud sponsor of the MacGathering™ which takes place May 19-20 in Los Angeles. Attendees should check their show bags for a gift from TeachMac. Created Equal, a nonprofit corporation dedicated to promoting social equality through innovative education. The launch of Moeller Electric's new XC200 modular PLC means that it is no longer necessary to specify a large and expensive PLC simply because an application requires Ethernet connectivity. The XC200 is available from KMParts.com, the largest authorized stocking dealer of Moeller Electric in the US. The XC200 not only has a 10/100Mbit Ethernet interface but also features an integrated web server as standard while remaining both compact and cost-effective. This is complemented by onboard FTP access and OPC server. In addition to its Ethernet capabilities, the XC200 CPU offers RS232 and USB interfaces, as well as a CANopen port which allows direct connection to fieldbus systems. Having eight digital inputs and six digital outputs built in, the basic CPU module is expandable by the use of compact modules up to a maximum of 494 digital I/Os. Profibus interfact modules and band Analogue I/O, counter are also available. The incorporation of Ethernet facilities means that the operation of XC200 PLCs can be monitored using a standard web browser, either via a local network, or over an Internet connection from anywhere in the world. This is particularly useful for factory monitoring, transfer of data to supervisory computers, and for performing remote diagnostics on equipment installed at sites where no local technical support is available. As an additional aid to fault finding and maintenance, the XC200 can also be programmed to send fault alerts and error messages by email. Designed to use economical and readily available MMC memory cards, the XC200 is available with either 256 or 512Kbyte each of data and program memory. For applications where Ethernet connectivity is not required, Moeller Electric offers XC100 PLCs which, apart from the Ethernet interface and OPC server, provide the same functionality as their XC200 counterparts. All XC200 and XC100 PLCs are programmed using Moeller Electric's XSoft Professional PC-based software package, which is fully compliant with IEC61131-3, and which is based on the popular and widely used Codesys PLC programming system. In addition to powerful yet easy to use tools for program development, XSoft Professional also offers simulation and fieldbus configuration facilities. Acromag has released a new version of their I/O Server Industrial PC, this time with an AMD Geode® CPU to reduce costs as an alternative to PC/104 or CompactPCI embedded computers. Field I/O signals are interfaced through an internal carrier card with related plug-in I/O modules. 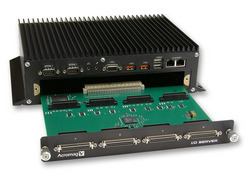 Working together, the rugged, fanless box computer and conduction-cooled I/O modules provide a truly integrated system for many measurement and control projects. The Geode CPU processes the I/O signal data and manages numerous interface connections for peripherals and networking. Inserting a mix of up to four mezzanine IOS modules on the slide-out carrier card enables A/D, D/A, discrete monitoring/control, counter/timer, serial communication, and FPGA computing functions. High-density connectors on the front panel provide clean cable access for 192 channels of field I/O. Advanced heat management allows -40 to 75°C operation without open vents or fans. A Model IOS-7200 I/O Server PC starts at $ 1695. "The I/O Server's tightly integrated approach to embedded computing and I/O signal processing is ideal for many applications, such as machine control and factory automation,” states Joseph Primeau, sales and marketing director – embedded products. Defense and aerospace system developers will benefit from the unit's high-performance and rugged construction. The compact design is also shock and vibration-resistant for mobile server and transportation projects such as rail or trucking. A wide temperature range satisfies the requirements of outdoor signage and display systems. Additionally, the interchangeable I/O modules offer flexible I/O configuration to easily accommodate continually evolving scientific research, simulation, data acquisition, and test & measurement projects. The IOS-7200 Industrial PC is equipped with an embedded AMD Geode LX800 500MHz CPU with 512MB of DDR400 DRAM that runs on Windows® Embedded Standard or Linux®. Standard interfaces include VGA graphics, two Ethernet ports, two serial ports, four USB ports, a CompactFlash® slot, and audio input/output jacks. An internal 2.5” PATA hard disk or solid-state drive is accommodated as a user-installed option. Acromag has designed and manufactured measurement and control products for more than 50 years. They are an international corporation with a world headquarters near Detroit, Michigan and a global network of sales representatives and distributors. Acromag offers a complete line of embedded I/O and industrial computer products for military, aerospace, manufacturing, transportation, utilities, and scientific research applications.